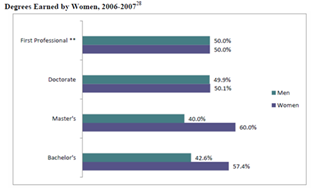 In honor of National Women’s History Month 2012 and its theme of “Women’s Education – Women’s Empowerment,” I wanted to write about a thought-provoking publication that just came across my desk about women and their evolving role in the U.S. workforce. 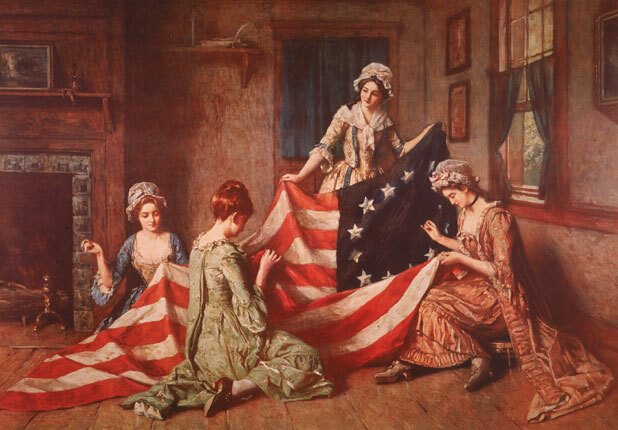 Since the founding of America, women like Betsy Ross have played a critical role in contributing to the economic fabric of the U.S. economy and American households. Image: Sewing circle presided by working mother Betsy Ross, who started out as first a home sewer before being educated as an upholstery apprentice. She then ran an upholstery business with her husband, before managing her own business when her husband died by sewing tents, blankets and flags for the American Revolution. “Invest in Women, Invest in America: A Comprehensive Review of Women in the U.S. Economy” was prepared by the Joint Economic Committee of Congress. It forms part of GPO’s Online Bookstore National Women’s History Month collection of Government publications celebrating women’s contributions to America. Part I of this publication starts with an overview of the decades of progress of women in the workforce. 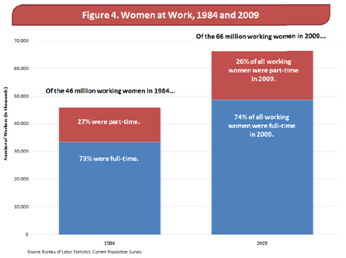 For the first time, we learn that women now comprise half of the U.S. workforce. 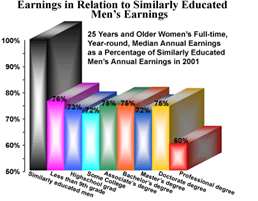 Next, relating to this month’s theme of education providing empowerment for women, the report shows that women earn more college degrees than men at every level, from 57.4% of the bachelor’s degrees to over 60% of the Master’s degrees in the United States. And it demonstrates just how important women’s earnings have become to overall household income, particularly in families with children. 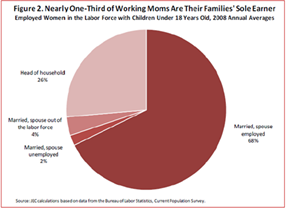 For example, by 2008 over 6 in 10 families with children under 6 have the mother working outside the home, and women are the sole job-holders in over a third of American families with children. Under this factor, the report puts forth both current figures and possible causes about why “women remain dramatically underrepresented in corporate boardrooms and executive suites” in the United States. 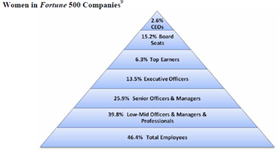 Some figures shared in the report show that while women comprise 46.4% of all Fortune 500 employees, they make up just 15.7% of board seats, 14.4% of executive officers, 7.6% of top earning executive officers, and only 2.4% of CEOs. In the private sector, “Invest in Women” reports, “women working full-time earn only 77 cents for every dollar earned by men”— a gap the report says has not improved since 2001. This wage gap is true also for the Federal Government where “women managers earn 81 cents for every dollar earned by their male manager peers”. This ends with an interesting analysis of the nation’s current retirement system and its effect on women. 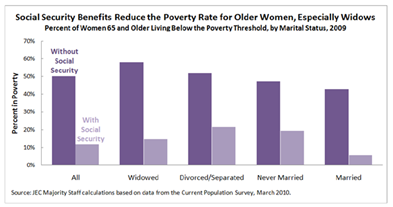 The report points out the lifetime earnings penalty—caused by the many interruptions over the span of a woman’s career to provide unpaid at-home care for children, elderly parents or ill family members— results in vastly decreased Social Security income for women, thus increasing women’s poverty rates later in life at a rate of 11.7% vs. 7.4% for elderly men. Differentiating the impact of tax and entitlement reforms on women versus on men. The second part of the publication compiles various reports and hearings held by the Joint Economic Committee that referred to women’s issues covering four areas: Women in the Economy Today, Equal Pay, Access to Benefits and Retirement Security. It is chock full of charts, tables, graphs and quotable quotes. HOW DO I OBTAIN “Invest in Women, Invest in America: A Comprehensive Review of Women in the U.S. Economy”? Buy it online 24/7 at GPO’s Online Bookstore. Buy it at GPO’s retail bookstore at 710 North Capitol Street NW, Washington, DC 20401, open Monday-Friday, 9am to 4pm, except Federal holidays, (202) 512-0132.